We have introduced a few nice phone lens sets for iPhone and outer smartphones. If you need a handy way to take your phone lenses, the little phone lens bag should be a nice solution.This is a practical small pouch designed to offer you an convenient way to take your phone lenses along with your smartphone. 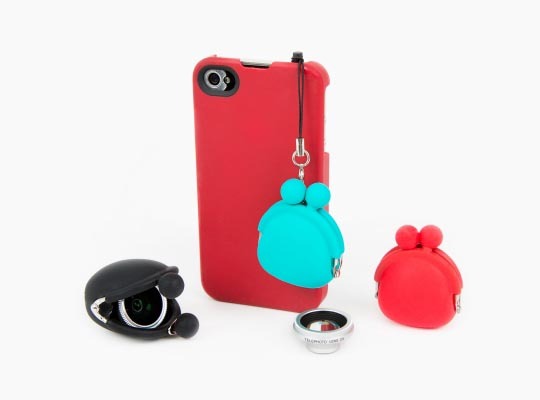 As we can see from the images, the little lens pouch features an adorable design with bright color, and is made of silicone material in order to prevent your phone lenses and smartphone from scratching. Moreover, you can plug its plastic peg into the headphone jack of your smartphone for easy to carry. Of course, you can also attach the lens bag to your keychain or camera strap. In addition to carrying your phone lenses, the lens pouch can also be used to hold your memory cards, a lens cloth and other little accessories.The little phone lens bag is available in three colors, each one is priced at $15 USD. If you’re interested, jump to Photojojo online store for more details.